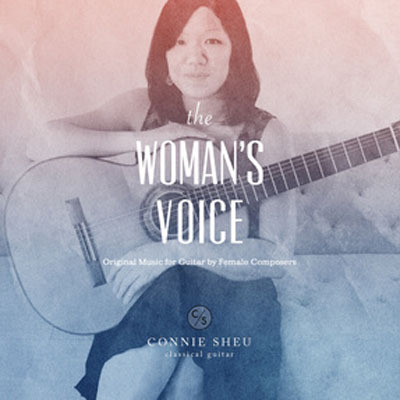 The Woman's Voice, Connie's second album, is a groundbreaking collection of original music for guitar by female composers, much of which has never been recorded. The four composers featured on this album represent a diverse collection of musical styles and personalities. Emilia Giuliani-Guglielmi, daughter of the famous Mauro Giuliani, played duets with her father and was known throughout Southern Italy as a guitar virtuoso until she died tragically early for unknown reasons. Her piece Variazioni su un tema di Mercadante is full of her father's musical influence while her own compositional style shines through in Sei Preludi. Also on the album is Ida Presti's homage to the great maestro, Segovia. Presti (of the renowned Presti-La Goya Duo) was known for her blazing technique and elegant artistry, and this solo work was only recently discovered in the Segovia archives. Three Preludes are written by Dale Kavanagh, a Canadian-German guitarist whose fiery playing has wowed audiences far and wide. The four movement work, Homenaje a Segovia by Annette Kruisbrink, completes the album. Kruisbrink is a Dutch guitarist who has won numerous accolades for her prolific compositional output.